In a few short hours, 30 of us will commence a trip of a lifetime learning first-hand about the latest developments in the Chinese Economy and exploring business opportunities in Shenzhen, China (aka the Silicon Valley of Hardware) and Hong Kong. Our research proposals and interest in the Chinese economy are as diverse as we are – from launching a local beer company to exploring clean energy opportunities and to developing e-commerce businesses across various industries. In order to be well equipped to complete our report following the trip, a robust agenda has been prepared – In between a lot of dinners and sightseeing, we will visit the Hong Kong Stock Exchange and the Hong Kong Monetary Authority as well as select leading companies in various industries – internet, telecoms, hardware. We will also have some free time for self-arranged meetings. Our preparation has been very useful to guide us on how to take full advantage of this trip and we are very excited and ready to explore growth opportunities in this transforming economy. Stay tuned! Tonight, 40 of us will gather for a kick-off reception starting our journey through the Philippines. Over the next 7 days, we will venture through the country, exploring the natural beauty of the region, while meeting with industry leaders in finance, energy, politics, hospitality, and more. But before I get ahead of myself…let me first recap the past 80 hours. So here it is…80 hours in Hong Kong, as told by food. Tsui Wah: after arriving at 6am to a deserted city, we went roaming for a quick meal to satisfy our time-zone confused hunger pains. We happily found Tsui Wah open and serving their breakfast menu, which immediately exposed the difference between an American breakfast and that which we would come to expect over the next few days. On the menu: soups, noodles, meat. I decided on the Satay Beef with Instant Noodles in Soup. The spice immediately kicked my palate into high gear…I could get used to this style breakfast! Tim Ho Wan: as an aspiring restaurateur, I have been counting down the seconds until I could venture to Tim Ho Wan, the cheapest restaurant to ever have received a Michelin star. After a morning of exploring the Nan Lian Garden and Central Hong Kong, we had worked up an appetite worthy of our first Dim Sum meal. We arrived at the restaurant and were handed a slip of paper with all the menu options. Overwhelmed, we began to mark off our choices – shrimp dumplings, rice bowl with beef, crispy chicken and chive spring rolls, turnip cakes, and before we know it, dishes upon dishes were being placed in front of us. The restaurant definitely met expectations – each bite was better than the last, and then the bill came and our jaws dropped – it came out to approximately 10 USD per person. Definitely a meal for the books. Al’s Diner: as dinner time came around, we were still full from our earlier dim sum feast, so we decided to peruse the bar scene right outside our hotel and grab a quick bite. Representatives from each bar and restaurant lined the streets and tried to pull us in, promising us great drinks and fun at their establishment. After much back and forth, we settled for an outdoor spot with festively lit tables lining the front. We got the menus and saw that it was an eclectic mix of food – largely American. So an order of unappealing burgers later, we made a pact – for the rest of the trip we would only eat local cuisine…and leave the American food to our friends back home. LKF by Rhombus: our second morning gave us the luxury of having the breakfast buffet that was included with our room in the hotel. A full plate of dim sum and a bowl of fruit later, we were ready for our day. Temple Street Spicy Crab: as we ventured to the Temple Street Night Market, we stumbled upon a restaurant that had spilled out onto the street. One of my friends recognized the name from one of the recommendation lists we had received so we decided to check it out. We got the spicy crab, the restaurants namesake. It did not disappoint. One interesting thing though was we were not given any utensils beyond chopsticks, so had an adventure trying to rip the crab apart and pull out the tasty meat. After a bit of a struggle and a lot of a mess, our stomachs were full and we were off again to explore the market. Din Tai Fung: I am waiting for this place to come to NY…and I volunteer to help open it. The Taiwanese restaurant has had immense success and has spread across Asia and onto other continents – even to North America with several spots in LA and Seattle. Looking into the kitchen, it looked like a factory, with all the team of dumpling makers wearing all white with matching caps. They provided us with an instruction manual for how to properly eat soup dumplings, their most popular menu item. 1-part soy sauce, 3-parts vinegar, mixed with a bit of ginger. Pick the dumpling up with chopsticks and dip into the sauce combination, place in soup spoon. Poke a hole in the dumpling with your chopstick so the broth runs out, and then put the whole thing into your mouth. It was incredible. We learned there is one in Manila, so we may be back by the end of the trip. Peking Garden: for the grand finale, we had to go to a traditional peking duck meal…and it was worth every penny. They put on a show with the “Noodle Dance” as they broke noodles down and stretched them to size for all guests to watch. That was followed by a delicious BBQ duck with hoisin sauce and green onions wrapped in a little pancake. We paired this with pea sprouts and mushrooms, shrimp and chive dumplings (had to have them one last time), and of course the noodles that we watched them make. Perfect end to a perfect foodie vacation. Next stop Philippines for #chazeppines. I entered the Chazen Hong Kong & South Korea trip excited about the opportunity to explore a somewhat familiar industry in a completely unfamiliar place. And we did just that. In our amazing, motley crew of 30 students, we heard from trailblazers in the media, arts and entertainment space. From tech executives who shared their vision for connecting the next generation of consumers to famed news anchors who opened up about how they maintain journalistic integrity while running a profitable business, we got a candid look at the east Asian marketplace. The topics we once learned about in coffee chats and trade rags, were now tangible. We no longer had to read about the trends, we were with the decision-makers driving them. It was that experience that was truly invaluable. While I was proud to leave the trip with deeper insights around the challenges studios face in getting movies into China and the hurdles digital music services encounter when acquiring customers across borders, for example, my biggest lessons of all boil down to perspective. It’s easy to be U.S.-centric and think about how to take advantage of this “all about Asia” wave as American companies focus their sights abroad, but it’s more important to truly dive into why these markets are deemed so valuable in the first place. There are so many unique cultural, economic and political insights to be uncovered that can make businesses and business leaders in any country more innovative and effective. My most important takeaways from the trip all center around three key themes. Culture is one of our most valuable exports. It’s easy to forget that our culture creates some of the world’s most valuable products. The music we love, the movies we watch and the stories we share are not only entertaining, but how we connect with the world. The ability to harness the power of that connection is the foundation of media and entertainment industries all across the globe. Seeing the enormous growth of the Korean wave (“hallyu” 한류) and the opportunities it has created for the economy are direct proof of that. While automotive exports may generate over $60B in value, the phenomenon of Korean entertainment and pop culture has brought bringing pop music, TV dramas and movies to masses and an enormous opportunity for the Korea economy. Everything can be branded. Even with a background in advertising, I have taken for granted the depths at which consumers connect with brands. Our visit to S.M. Entertainment, however, brought this insight to another level. The team known as “the company that created K-Pop”, is not only a record label and talent agency, but a branding juggernaut. In the States, kids may have had a Justin Bieber backpack or a One Direction lunch box, but in Korea, consumers are drinking Girls Generation white ale and paying a premium to eat Red Velvet red velvet cupcakes. The sophistication with which Korean companies approach branding easily eclipses what we have seen in the U.S. It is an enlightening reminder of the ways in which American brands can think outside the box to create unique and compelling lifestyle experiences for their customers, far beyond what is expected. Localization is everything. East Asia is a rich and complex economic environment and each country, region and city has their own unique culture, norms and beliefs. Acknowledging, respecting and investing in that is the only way outsiders can even have a shot a piece of the pie. As students we are easily seduced by flashy global brands, but a closer examination of strong, local players could give us even more insight into how to create new opportunities to drive growth and profitability for any business in which we may operate. Our visit to KKBOX proved just that. Most of us could easily talk about Spotify’s scale or Apple’s network effects, but KKBOX showed us how truly thinking local can not only drive revenue, but also create new business opportunities. While U.S. players may rely on recurring credit card payments, for example, KKBOX recognized that they could acquire more diverse customers with a wider range of payment options. Their partnership with local telcos, peer-to-peer communities, and even convenience stores are a prime example of this idea of local innovation that we could translate into all markets. So while I was sad to see our trip come to an end, I feel lucky to know that I got far more out of this experience than I could have ever imagined. I have tangible lessons about global businesses, and the media and entertainment space more specifically, that I can directly apply to my career as I prepare to leave CBS this spring. The greatest gift though, as I think all of us could attest, were the relationships we were able to create during our whirlwind ten days abroad. From realizing we didn’t bring enough layers to brave the Korean cold or getting pressured into trying Cantonese chicken feet for the first time, we all had this unique chance to jump outside of our comfort zone, together. Because of that, I have created bonds with people through this incredible shared experience that I will never forget. Kicking off the new year in Hong Kong was nothing short of amazing. We finally left the cold weather behind in Seoul to traipse around the bustling (and finally warm) Hong Kong city center. We started our HK leg of our trip with a tram party on what is colloquially referred to as a ding ding. These double decker vehicles are one of the oldest forms of public transportation in the city, and we had one all to ourselves. Equipped with snacks and playlists provided by KKBOX (more on them later) we rode around the city in style, getting a lay of the land. After the tram party, we darted off to see the famed Symphony of Lights at night in Victoria Harbour. The multimedia light and laser show features synchronized music and narration that celebrates to spirit of the city. More than that, it is an impressive collaboration of more than 40 businesses who work together to project the show from their buildings on both sides of the harbor. The rest of our Hong Kong leg was spent exploring the city and getting the inside scoop on east Asian music, film, arts and culture from a series of phenomenal company visits. We visited Eaton House, a co-working space in Central, to meet with Winnie from KKBOX, Asia’s leading digital music subscription service. She spoke about how the Taiwan-based company maintains their competitive advantage against global megabrands like Spotify by creating unique delivery methods and leveraging local industry relationships. By utilizing a wide range of payment methods including telecom partnerships, top-up cards at local convenience stores and e-vouchers, we saw how KKBOX is able to acquire consumers in ways many U.S.-based companies have yet to explore. Later we visited Eslite, one of the largest retail bookstore chains in Asia. The Taiwan-based company carries the biggest selection of English language publications in the region and has also established itself as a cultural space where books, visual and performing arts, design, coffee, and people come together. We saw firsthand how the company creates unique spaces within the multi-level store to connect consumers to niche local products and brands far beyond books. From tea makers and chocolatiers to cosmetics brands and leather goods makers, Eslite houses distinct brand spaces that encourage visitors to explore and interact with new brands that reflect their identities. Our final company visit, and probably the most anticipated of the trip, was at Sony Pictures China. There, we met with senior leadership from the Production, Research and International Distribution teams who gave us their candid evaluation of the Chinese film business, the opportunities it presents and how they are approaching the business at Sony. From the quota system and co-productions to the ratings system and blackout dates, the Sony team gave us what felt like a Chinese Film 101, exposing the complexities of this growing entertainment market. While we all knew the world is watching the Chinese movie market, we were surprised to see how complex entry into the space really is and particularly how U.S. brands have to roll the dice a bit to succeed. All in all, our Hong Kong office visits were a whirlwind, but undoubtedly left us all with a new perspective on the business of music, arts and entertainment. While we objectively learned about the East Asian entertainment space, I think we all took home more than we expected that we can apply to our home countries and careers, wherever they may be. More to come on my key takeaways from the trip. Since I was accepted to CBS nearly two years ago, I’ve been not-so-secretly plotting how I’d work my way through my “Around the World” bucket list during my time at school. What used to be just a laundry list of countries I saw in coffee table books or screenshots I saved from Instagram all of a sudden became a tangible reality. For the first time in life, I was surrounded by a group of peers who had the same passion (and equal intent) to see the world. And even more than that, we all finally had the time to do it. Never would I expect that someone would send me a group text at midnight on a random Tuesday saying “Hey, you want to go to the Philippines”, and I’d end up booking a flight within hour. But that’s been the beauty of my CBS experience. I’ve wanted to take every opportunity to make the most of these absurd and amazing two years that we call business school to see the world. It was this mindset that took me to beaches of Punta Cana with more than half of class of 2017 last fall and what led me to the deserted shores of the Island of Palawan with fifteen of my clustermates last spring. It is that same mindset that makes me so excited for my first official study tour with Chazen. Tomorrow, I’ll start my 19-hour journey from New York to join Chazen Seoul/Hong Kong. Our amazing student organizers have dubbed our trip East Asia: The Perfect Pop-Cultural Storm and I couldn’t have asked for a better fit. I came to business school to transition into media and entertainment, so I couldn’t pass up on this chance to dive into two of the fastest growing arts and entertainment markets in the world. I’m excited to see what’s in store for us over the next ten days and look forward to chronicling my journey here. Our final day abroad was spent traveling to Hong Kong, experiencing the process of passing through immigration from mainland China to Hong Kong Island. We learned that due to political limitations, there is a daily cap of residents of mainland China who are able to visit Hong Kong in any given day. 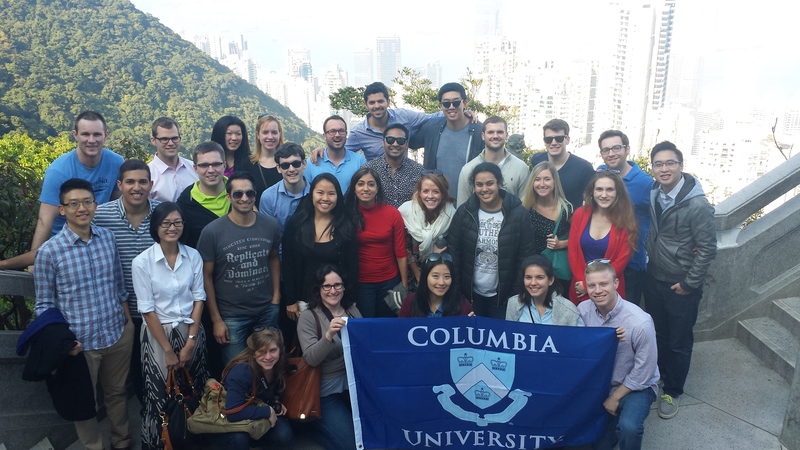 Our planned company visits were complete and we had a full day on Saturday to explore Hong Kong. The island was not as I expected it. Previously, I saw photos of the International Finance Center, a sky scraper housing restaurants, a mall, the logistics and baggage transfer portion of Hong Kong airport and large firms in its tower. I extended this image to the rest of Hong Kong and imagined it as an island covered in large, marble office towers housing retailers of luxury goods. Instead I explored the narrow, hilly streets lined with everything from local fare to high-end fashion designers and artisans’ boutiques. We visited the Police Married Quarters (PMQ) which is an adaptive reuse project consisting of two buildings formerly used as police barracks that have been transformed into a unique shopping mall housing local and international artisans and their trendy wares. The phrase “hipster central” would be an appropriate descriptor of this mall. The city has rich character. Unfortunately, we only visited for one short day and were unable to see even a fraction of the sights available to us. Unlike during the previous days, we used Saturday to explore the city in small groups, deepening our conversations with one another and really coming together as a group. I’m grateful for the opportunity to witness China develop as a nation. I’m curious to see if this government-initiated (almost forced) growth and expansion will propel Guangzhou and Shenzhen into sustainable growth or if it will create the next ghost cities due to oversupply of office buildings. What is the future of public transportation expansion in Singapore and China as this is the one feature critical to upholding future real estate development? Will China ever place a moratorium on the number of massage parlors present? As I’ve never been to Asia before the Chazen study tour, I was surprised to find how modernized Hong Kong and Taiwan actually were. I was less surprised by the former, as Hong Kong has been considered a developed region for some time. And by the end of our visit in Hong Kong, I came to the conclusion that Hong Kong was the “NYC of Asia”… at least in my view! But Taiwan was unexpected – while there was a lot of farmland and undeveloped property across the country, the actual city of Taipei was quite similar to a mid-sized city in the States. There wasn’t quite the hustle and bustle of a New York City scene, but there were plenty of cultural sites to see and the nightlife was certainly not lacking. Bars and clubs lined many streets, and the night market was something special. With that said, there were certainly cultural differences apparent in both Hong Kong and Taiwan that are worth highlighting. When walking the streets of Hong Kong, I was overwhelmed by the number of hardware and home improvement stores. It was an observation that was made by several other students on the study tour as well. As I think back and reflect on this, it seems logical. While new construction is certainly not that prevalent in NYC, the residential areas and infrastructure in general are much older and more dilapidated in Hong Kong. It only makes sense that residents in the city would want to make improvements to their homes. There were also several commonalities between Hong Kong and Taiwan that are starkly different from what we’re all accustomed to in the States. First, in almost every restaurant we had lunch or dinner, it was difficult to come across a pitcher of water (or even a glass of water for that matter). While we’re used to being served water with every meal – often without even asking – the tradition in Hong Kong and Taiwan (and I’m guessing across Asia) is to serve tea instead. It seems trivial, but for someone who doesn’t drink a lot of tea, it didn’t go unnoticed! Another observation throughout the tour, but particularly when we were on the trams in Hong Kong, is the abundance of retailers and shopping malls in the area. I never really considered Asia to be such a consumer driven society, but I now think twice when comparing consumer trends in the States to countries in Asia. One last observation – I found that I often received “free” gifts when purchasing merchandise above a certain dollar threshold. This is certainly not customary in the US, and something I found to be not only amusing, but also very generous! Regardless of the cultural (or otherwise) differences experienced between the States, Hong Kong and Taiwan, my biggest takeaway from the trip is that at the end of the day, we are all people. I thoroughly enjoyed getting to know each and every person that embarked on this amazing journey… it was certainly the journey of a lifetime. I have made many great friends that I otherwise may never have met at CBS, and for that I am grateful. I would like to thank the Jerome A. Chazen Institute of International Business for giving all of us at Columbia the opportunity to participate in these study tours. I would also like to once again thank our fantastic organizers – Karl, Gina & Justin – without all of your hard work, this study tour wouldn’t have even been possible. I look forward to traveling more through Chazen Institute next year and post-graduation with family and friends. It’s been real folks. 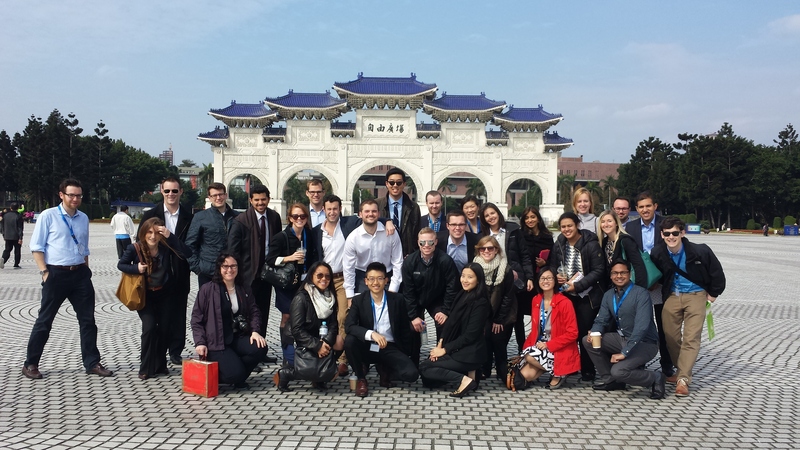 Hong Kong & Taiwan 2015 Chazen Study Tour was a blast, but that’s all for now!